Home » Do You Dream About UFO’s? Have you ever dreamt about seeing a UFO or being aboard one? What do these types of dreams mean? Many people will live their entire lives without ever seeing a UFO. My first UFO sighting occurred in 1978. A group of friends and I decided to have a keg party “On Top of the World”, which is a mountaintop in the Catskill Mountains in upstate New York. It was early evening and we were waiting for the person to arrive who had the tap for the keg, so all of us were sober. At that point, a group of 3 UFO’s flew over the adjacent hill, Franklin Mountain… hovered for a few seconds, then flew away at a speed unfathomable. At the time, there was probably 6 or 7 of us there to witness it, but that was my first of many UFO sightings. My late sister, Lola, had an abduction scenario where she was with her boyfriend and another friend, Patty F.. They were driving toward East Sidney Dam when the next thing they knew, their car was on the side of the road and it was 4 hours later. I have seen more UFO’s than ever. You can’t go 10 minutes without seeing one! Many of us have experienced UFO sightings in real life, but what do they mean when we see them in our dreams? To see a spaceship in your dream symbolizes your creative mind. It denotes a spiritual journey into the unknown and signals self-development and self-awareness. Alternatively, the dream suggests that you need to take on a different perspective, no matter how bizarre or unusual it may be. Suggests a change in yourself, or personal growth; becoming aware of something new, or some new aspect of yourself, one that you are not familiar with, and so seems strange or alien. For instance a change might be occurring in the way you relate to people or events. Our mind has the ability to view our experience as a whole, rather than in parts. What we sense unconsciously in this way is presented to the conscious mind as images such as UFO’s or circles of light. Another way of explaining this is to realize that our conscious self is only a tiny part of the whole process of life active in us. There are amazing potentials in each of us that might only be glimpsed in stress situations. Occasionally this more powerful or bigger side of ourselves breaks through and is experienced as an alien, or great being. Because of the hallucinatory aspect of the dream process, and the fact that in dreaming we see exterior imagery as real, when this breaks through while we are awake, it is difficult to accept the source of it as our own unconscious. See: altered states of consciousness; space; spaceship. A few weeks ago, I had a dream where I was “back home” with my daughter. I was looking out of my parent’s bay window when I saw dozens of UFOs in the sky along with a huge mothership which came down to my parent’s house, hovering about 30 above the ground. It was so close, I could see the beings inside, who looked like regular people. I called for my daughter while taking out my smartphone to get a video of everything. As I looked through my cellphone, my screen was showing me everything that was beyond the 3rd dimension. It was exciting and exhilarating. I felt no fear. In another dream, I was once again “back home” at the college, which was about 2 blocks from my parent’s home. There were many spaceships in the air but one had landed at the college. There were many people there who were boarding the ship. I was one of them waiting to go aboard. I woke up before I actually boarded the craft. I was in a very large round room and there were small groups of people all around me. We all looked like we were in our 20’s or so. I was in a group of about 8-10 people and our thoughts were instantly interactive through telepathy. Each group was creating and manifesting something, but I don’t specifically remember what it was. What I do remember is that is was a group manifestation and we were all on the same page. For example, someone would think of a contribution to the group and another would add to it. Each additional thought made the manifestation even more amazing. If someone joined the group, they would instantly know everything we manifested before they joined us and would immediately be able to interact with the group. If you wanted to take a break, you could leave any time. I chose to leave and went “back home”. I was in my old neighborhood, playing guitar on a futuristic amplifier that was no bigger than a pack of cigarettes and did not require electricity. In this dream, I knew every possible scale on guitar and could play amazingly well. Two friends joined me… one to listen and another to play along. I knew at any time, I could go back to the ship. What this dream showed me is that if we somehow go into a dimensional shift would want to blow up the world with their thoughts. It’s not even a remote possibility. It’s as if you are one cell in a body and you’re harmoniously interacting with all of the cells around you, instantaneously. Your soul is completely transparent and there is nothing in your past to be embarrassed or ashamed about. Your dreams are metaphors being played out from events that occurred earlier in that particular day. If you had a disturbing dream, then look back at what might have triggered those particular metaphors or symbols and try to resolve that issue. Once you remove any fear from your mind, you’ll find that your dreams become more futuristic and prophetic. I’d be willing to guess that many people who have done their inner work within this genre have either seen UFOs in real life and/or have experienced UFO dreams. 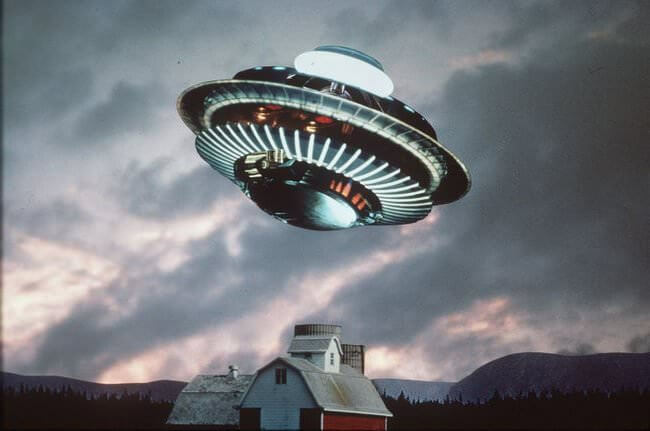 Have you dreamt about UFOs or going aboard a UFO? If so, comment below! Are Prehistoric Giants Waiting in a Stasis Chamber in Iran?